Please Note: The affiliate program is deprecated feature that is no longer available for newly provisioned sites. A potential affiliate uses your affiliate program sign-up form to submit an application at Affiliate Signup. URL: http://www.yourdomain.com/store/affiliates/join/apply.aspx When the information is submitted, it is entered into the database with a "pending" status. You can then choose to either approve or deny the application. Upon approval, the affiliate is created and ready to begin. You can create the affiliate manually from the affiliate list page. Click the New button on top right to bring up the affiliate editor, where you can input the affiliate's details. Click the New button to enter the affiliate editor and begin adding a new affiliate. First, enter the settings for this affiliate. Fill out the affiliate application with the information for this affiliate. These are the same fields used by an applicant using your affiliate application form. Each section of fields has a description above it explaining their purpose. When finished, click the save button at the top of the page. The affiliate should now be present in your Affiliates List with the status assigned. When an affiliate applies, you should receive an email with their information. Click the link in the email to open your administration console and bring you to the Affiliate List page. Any new applicant to your affiliate program is listed with a Pending Approval status. This can easily be identified in the status column. Changing the status of an affiliate (to approve or deny) is a simple process, detailed below. You can check many boxes at once to change a batch of affiliates en masse. You can also select the box in the column header to check all boxes. In the More Actions menu, click Change Affiliate Status, then select the desired status. That's it... your affiliate is approved! From the Affiliates List page you can view a brief overview of each affiliate in the grid on the page. To edit an affiliate, simply click the Edit button at the beginning of the row of the affiliate you wish to edit. You are brought to the affiliate editor where you can edit any of the affiliate's information. To view a detailed report about affiliate sales, go to Reports > Marketing > Affiliate Analysis. To delete an affiliate, click the Trash Can Icon. A confirmation dialog will pop up asking to confirm the deletion. To change the settings for your site's affiliate program, navigate to Settings > Marketing > Affiliates. Once a customer registers or places an order via an affiliate link, that affiliate associates with the customer. All future orders are flagged as that affiliate as well. There's no way to have the affiliate link "expire" via a cookie or any other mechanism. 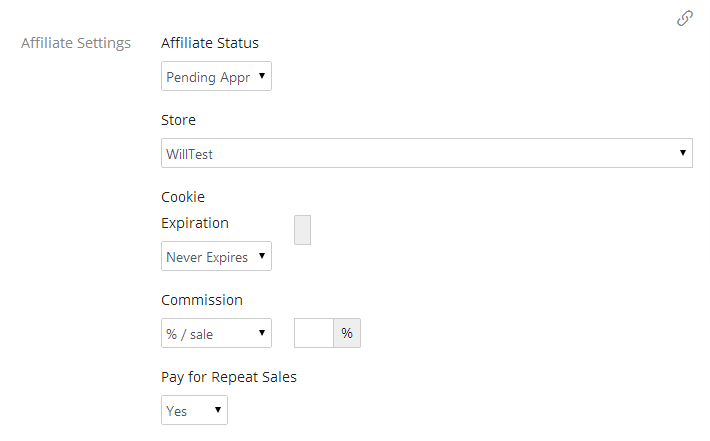 Affiliates can be configured to not pay for repeat sales, however.